Spring Wind Blow, Prices Flow! Order and pay from 25th till 30th of Aprel 2019. *This price offer is valid ONLY on Aprel from 25 till 30 2019. Orders are completed within 25 days. Prepayment is 90%. On MOTHER'S DAY 21st of March for all loving sons and caring daughters discount for windows "Mom's gift" 21%. This offer is valid ONLY from 21 till 31 of March 2019. On Valentine's day to all PVC windows lovers discount 14% for any type of your favourite windows. Only from 14 till 19 of February ECO House gives all lovers 14% discount as a gift. Congratulation on 6 October! 20% OFF for PVC Windows! For the feast on 6th of October. For residents of 6 October and ALL the military men, only twenty days 20% discount for white windows of any design made of the best profile. This offer valid from 6 to 26 October 2018. Happy Eid Al Adha! 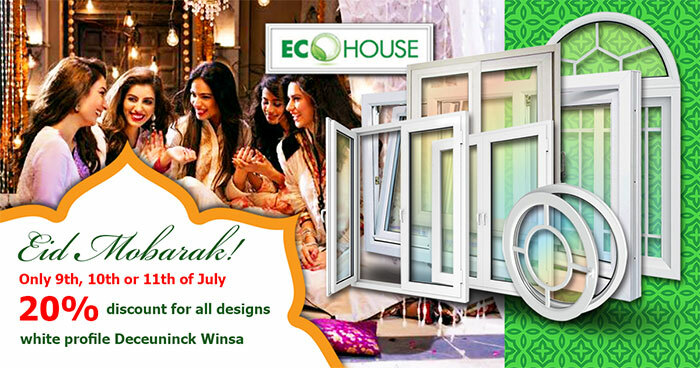 Only till the end of August 20% discount for all white color PVC windows designs. Order and pay till 31 August 2018. Ramadan Mobarak! Happy Eid Al Fitr! Only three days 20% discount for all white color windows designs. Order and pay 18th, 19th or 20th of June 2018. Spring Wind Blow, Prices Flow! Happy "Sham El Nessim"! Only three days 20% discount for all PVC windows designs. Order and pay 11th, 12th or 13th of April 2018. On MOTHER'S DAY 21st of March for all loving sons and caring daughters discount for windows "Mom's gift" 21%. This offer is valid ONLY one day 21 of March 2018. For the feast on 6 October. For residents of 6 October and ALL the military men, only twenty days 20% discount for all design white windows made of the best profile Deceuninck WINSA. This offer valid from 6 to 26 October 2017. Spring Wind Blow, Prices Flow! Happy "Sham El Nessim"! 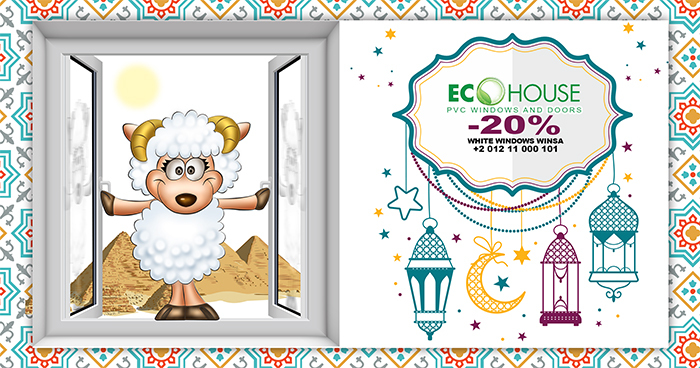 Only three days 20% discount for all PVC windows designs. Order and pay 18th, 19th or 20th of April 2017. On MOTHER'S DAY 21st of March for all loving sons and caring daughters discount for windows "Mom's gift" 21%. This offer is valid ONLY 21st of March 2017. On Valentine's day to all PVC windows lovers discount 14% for any type of your favourite windows. Only on 14th of February ECO House gives all lovers 14% discount as a gift. Ordering any type of windows, you will get free installation. For the feast on 6 October. For residents of 6 October and ALL the military men, only twenty days 20% discount for all white windows made of the best profile Deceuninck WINSA. This offer valid from 6 to 26 October 2016. ONLY 4 Days - EID AL ADHA OFFER! Happy Eid Al Adha! Only 4 days in September 20% discount for all types of white windows. This offer is valid only 5th, 6th, 7th or 8th of September 2016. Order is completed with white color Deceuninck WINSA profile and translucent single glass. Orders are completed within 45 days. Prepayment is 90%. Ramadan Mobarak! Happy Eid Al Fitr! Only three days 20% discount for all white color windows designs. Order and pay 9th, 10th or 11th of July 2016. Spring Wind Blow, Prices Flow! Happy Sham El Nessim! Only three days 20% discount for all windows designs. Order and pay 7th, 8th or 9th of May 2016. On MOTHER'S DAY 21st of March for all loving sons and caring daughters discount for windows "Mom's gift" 21%. This offer is valid ONLY 21st of March 2016. On Valentine's day to all PVC windows lovers discount 14% for any type of your favourite windows. Only on 14th of February ECO House gives all lovers 14% discount as a gift. Ordering any type of windows, you will get free delivery and installation. 23/04/19 PVC windows convenient for everyone. 22/04/19 Wind resistant PVC windows.